Just finished reading the debut release of “Chimera” from the talented writer Vaun Murphrey, and I found it easy to read and a satisfying story that had me thinking about it between the times I had to sit and read! 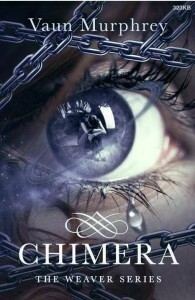 “Chimera” is a very interesting novel that presents ideas from both worlds of sci-fi and one could argue paranormal. It takes some of the most challenging ideas and techniques in writing and storytelling and roles them into one novel. Never have I read a book that was written in dual first person point of view and dealt with: psychology of imprisonment, teenage angst and self-discovery, not knowing who to trust and who were the good guys, world building, and traveling in space and in the mind. As you learn about the world of Cassandra (lead character) you’re swept into the whirlwind that becomes her life, driving you wantonly into the next book of the series. While Cassandra is only thirteen, I feel that it can be enjoyed by readers of all ages. Anyone who can do that gets thumbs up from me. Good job!